Sometimes you can be gobsmacked by something that you hear in a bar (OK often, but I digress). Such as a few weeks ago, when a doco director that had bucked the trend to moved here from Melbourne, explained to me what an artistically vibrant place Perth could be. I was stunned. Not because I disagreed with him, but because he was utterly correct and I hadn’t realised it. I was just caught up in the myth of Dullsville, the exodus east of friends, and the mundanity of everyday life to notice (in all fairness I do tend to spend a lot of my life in a dark cinema). All of which is a very long-winded way of explaining why I found myself in Perth on a Sunday morning, weaving between tourists taking selfies with kangaroo statues, to see the Perth Chamber Orchestra. Serenades in the City (the penultimate concert in PCO’s Heritage series for the year) marks the first time I have seen the little sister to the Perth Symphony Orchestra. It also marked a couple of firsts for PCO as well. The first time they had held a morning concert, and the first time they had held one in the settings of the Government House Ballroom. With the more traditional setting, they decided to lean more heavily into a less traditional theme, or to put it more correctly, a theme that is less thought of today. They set a slower, more relaxed pace of an era a century past. One of artistic Parisian salons, mingling dancers and painters, and of gently sipping champagne while listening to a string orchestra. Inspired by the life and works of the painter Edgar Degas. To do this Serenades in the City incorporates all these elements. Having ballerinas dance in a picture come to life to Elgar’s Sospiri, or to be drawn live by local artist Ben Brennan for the duration of a Glazunov piece. Although a little bit of a gimmick, the three art forms thread through the work, binding these disciplines. It’s nice to be reminded of that interconnectedness of arts, rather than to be narrowly focused on one aspect. Instead, seeing that they enforce and enrich each other by drawing on the same well of creativity. All done in such a way as not to draw attention away from the orchestra, but rather allowing the audience to select its focus. 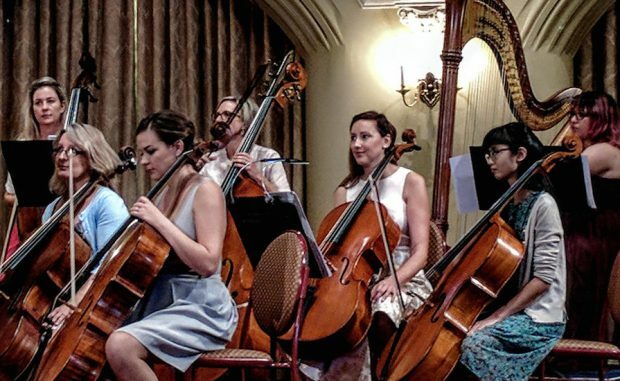 As for the Perth Chamber Orchestra itself, they approached the repertoire with joyful glee. From the lively plucking of the Playful Pizzicato movement of Britten’s Simple Symphony, the bubbly repast of Tchaikovsky’s 4th movement of Serenade for Strings as a finale, and beyond to the lighthearted laughter of the orchestra singing to Lionel Ritchie’s Easy for an encore. It was a light and bubbly presentation, in keeping with the champagne brunch theme. Not challenging, but illuminating with host Ros Appleby providing both context, and the odd amusing tale about the work or composer. It’s cliché to use the term “a delight to the senses”, yet when you are visually and aurally stimulated in such a joyous way, it is difficult to avoid the cliché. A pleasant aperitif on a Sunday morning to brace you for the rigours of the week to follow, and one that has me eagerly awaiting the baroque conclusion to the PCO’s Heritage series.